After 1990, the national secret service archives of many former Eastern Bloc countries were made partly accessible for scientific research. Although the accessibility of these archives has since led to research in history, sociology and literature, no systematic or analytical research has been undertaken in performance studies yet. The analysis of the records and documents of the secret service concerned with performance art leads to the restaging of the interrelationship between performance artists and secret agents – as both enacted and re-enacted in interrelation to each other permanently. By this series of pre- and re-enactments the state security intervened not only in the personal lives of the artists – but also into their artistic actions, but at the same time also the operative strategies of the state security is infiltrated with performative strategies based on re-enactment. Performance art was considered as an intrinsically subversive, Western art form, which fundamentally contradicted the maxims of the then-current socialist reality. For this reason, performance art was, from the outset, under special surveillance by the state and the secret services. 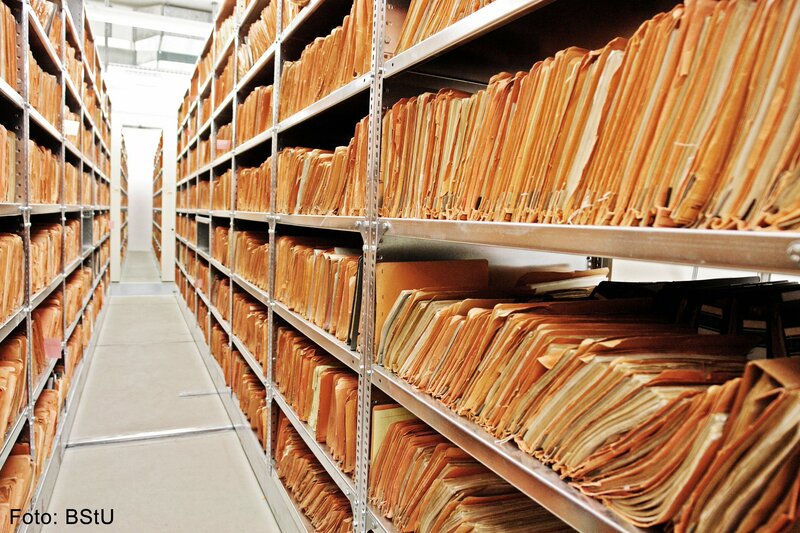 The most important instruments were surveillance and the systematic writing and archiving of reports – both instruments were carried out following guidelines created by the state security itself. These guidelines were meticulously orchestrated, highly repetitive, monotonous and almost catatonic. The secret service records reveal little about those being monitored, but far more about the various anxieties, fears and strategies of those doing the monitoring under the permanent force to pre-act, re-act and re-enact. These fears and strategies were triggered in the documents they produced on an enormous scope themselves: by the on-going almost mantra like repeating of the dangers, socialist society is facing by performance artists: this repetition and re-enactment of certain situations for example in training films produced especially by the state security on how to hand over classified material, how to surveill a person in public, how to camouflage ones identity, did contribute to an automatized re-enactment of certain always re-occurring scenarios. The agents had to perform. But the agents had to perform in their reports as well. This literal re-enactment is an immanent part of the strategies of the state security and can be traced in the minutiae of the records—their narratives, words, shorthand, punctuation, and omissions. Particularly notable are, for example, compiled lists on potentially dangerous artists, which included names from the artists’ social milieu, their activities, and contacts. These lists comply with a distinct aesthetic; they create a serial order where chaos is otherwise assumed. Performative strategies were not only carried out by artists; it is also the agents who had to “perform” over and over again in order to gain relevant information on performance art. It is thus unsurprising that artists were not only monitored by the state, but that the secret services also acted, in order to define and in any case interfere in this new development in art. It was thus crucial for the state security to develop tools in terms of theoretical approaches to detect whether an action or artist was a threat to socialist society or not. After 1990, many artists discovered the archive as not only a site of reclamation for their own lives, but also as artistic material. In Erfurt, for example, it was first and foremost artists who squatted the city’s Stasi headquarters (especially Gabriele Stötzer herself) in order to save the records from being destroyed. The work of Hungarian artist György Galántai showed the extent of spying that took place on the Hungarian art scene in his art archive Artpool, in which all the reports and records on him and his activities are placed in an open access online archive. The German artist Cornelia Schleime, who left the GDR in 1984, re-enacted sentences and recurring phrases from her records photographically – and re-enacted her own files created by unofficial informants and officers. But for former agents re-enactment is a dangerous practice to re-live certain situations. The vast majority of former IMs, agents, officers or even prison directors and prison guards have no sense of guilt and regret at all and they are still self-relieving themselves from any moral inner consequences. So did also Sascha Anderson, one of the most spectacular cases of a “successfully” conspired agent, who was a determining figure of the GDRs so called underground, at the same time being a diligent informant for the Stasi. In a documentary shot 2003 entitled “Anderson” the director of the film had surprised Anderson with the complete and meticulous reconstruction of one of the flats of a good friend of Anderson (whose wife he later seduced) where the centre of this underground unofficial artistic scene was in Berlin, and which Anderson frequented very often. When he entered this re-construction, in this moment of recognition he said he doesn`t know really, whether he is glad or not to see that, and this was the only scenario in the film, when some sort of insecurity or instability could be sensed in his behaviour. This instability was clearly caused by the re-entering of a re-constructed situation that made him re-enact his former entries into the very same room. Re-enactment is also a strategy of the state security that is clearly documented in the masses of the sheer material that is still there. Operational activities were based on doing the very same action and on writing the very same definitions and notions over and over again. With this mantra of actions and texts the state security created its own enemies, fictionalized its own scenarios of danger and often, triggered these potential sources of supposed danger themselves. Their narratives on enemies of “negative-hostile” forces were only possible in the fictive imagination of how an enemy of cultural practices would possibly act, think and re-act. This fiction was grounded and constructed as facts exactly by the re-enactment of certain practices. This means, the secret service archives can be treated as a reservoir of state performative practices, to make the pre- and re-enactment strategies of the secret services visible. Repetitive actions, strategies on how to pre- and re-enact contradicted for a long time to what was thought about performance art, as performance art was considered up until the end of the 1990s as an art form that cannot be saved, documented, and repeated. The state security noticed already from the 1960s to the end of the 1980s, that this is not the case: that it is an art form, that can be documented, saved and – as their biggest fear – it is by no means a singular action, never. But no state security officer would have ever thought, that the archive of the archive, based on their enacting/re-enacting strategies becomes one of the sources of research on the relation between the state and performance artists. The missing historical sensibility concerning these archives is manifest in one of the training materials for secret agents where it is stated: “the reconstruction of the past is the task of historians and not agents”.